The image above has been making the rounds on Facebook, and I've been raising questions about it. During the 1980s, some Holocaust Museums in the US were wracked by internal controversy over how, or whether, to handle the homosexual victims of Hitler's regime; in some cases, reactionary Jews were able to exclude such treatment altogether, arguing that sick, sinful homosexuals were trying to piggyback on the suffering of Hitler's real victims. I gather this has changed, though I don't have any details; the United States Holocaust Museum in Washington, D.C., does cover the issue. I seem to remember hearing about Conservative and Orthodox rabbis in the US joining hands with reactionary Christians against liberalization of laws against homosexuality, contraception, and abortion. I don't have any sources on that, but what I have here should be enough to show that ultra-Orthodox Jews aren't poster children for living and let live. "After you called," she said calmly, "I did some research. I talked to some rabbis. It's true that what you ... do ... is against our beliefs. But many of the parents of the kids in our school also do things that are against our beliefs. Some are unobservant. They don't keep Sabbath, they don't keep kosher. Some of the parents aren't even Jewish. It's not our job to judge people or to change them. Our job is to teach. So yes, I think we could make Erez comfortable" (227). Green didn't romanticize the Orthodox, being aware of their malign influence in Israel, but this preschool evidently had adjusted to being in an officially pluralistic society. Not too adjusted -- Green notes with bemusement that the female teachers "were loath to shake our hands. Not because we were gay; just because we were men" (ibid.). But it's also easy enough to find ultra-conservative Christians with a relatively tolerant and open-minded engagement with the world. I don't think that was the point of the graphic above. 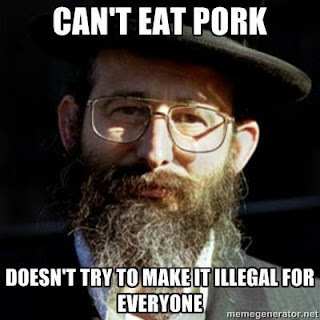 I think it was generalizing about Orthodox Jews, even though it's unlikely that whoever added the caption knew anything about the beliefs or practices of the man in the photograph: rather, they took a stock photo and added their message to it. And I found that when I pointed out some of the other side of the story, my mostly Christian friends made it clear that they assumed that the graphic did express the man's views. (So did many commenters on other postings of the same graphic.) One, for example, wrote "It seems that the ultra-orthodox Jews of Israel could learn something from our friend up there who is refraining from leading a war on the eating of pork and other non-Jewish folkways. :P" A Jewish friend replied, "I do agree that the Orthodox have a lot of issues... and I mean Orthodox (read fundamentalists) of ANY religion." (Fundamentalism doesn't equal orthodoxy, by the way, but that's another subject.) Either she'd missed the point, or was trying to dodge it. 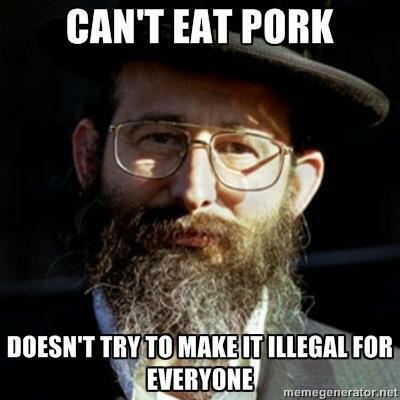 Another person accused me trying to tar all Orthodox Jews with one brush; I think this meme was trying to whitewash them. The guy in the photo is just a stereotype: that's his function. I know that not all UltraOrthodox males are antigay, nor do all of them spit on eight year old Orthodox girls who aren't dressed modestly enough to suit them, nor do all them riot to try to shut down parking garages that are open on the Sabbath. (I guess rioting isn't a violation of the Sabbath? Sounds like work to me.) I wouldn't assume too much about the beliefs of any person based on their religious affiliation, but that image is doing exactly that, probably based on ignorance and even misinformation, and it does so in order to stereotype conservative Evangelicals, who "have a lot of issues" but aren't all antigay bigots either. OK, should I just not post memes anymore? Do you all not like using memes to make points or is it necessary to accompany each image with several hundred pages of disclaimers? Oh, I know, don't you just hate the way life is so messy and complicated? Why can't we just stick to black and white, without any ambiguous shades of gray? Memes can be entertaining, and they can be used to make good points. I just think that this one is making a bad one, by romanticizing and exoticizing Orthodox Judaism, much as some people romanticize and idealize the Amish, or the Mormons. The point of the caption is, of course, a good one, but it's confused by using a photo of a member of a sect that is not particularly tolerant. And I think it's significant that so many people thought the picture spoke for its subject, about whose views we don't really know anything. It isn't inevitable that devoutly and conservatively religious people (even some atheists, to my sorrow) will try to impose their views on others, but many do. But maybe I'm missing the point. Is the man in the photo supposed to be an individual, or does he represent all Orthodox Jews?